Ideal for the pink loving chef demographic! Depends on whether you like bright pink coloured kitchen appliances! If you're looking for that perfectly pink microwave for your home, then your options are slightly limited - there are only a handful of pink themed microwave ovens available in the UK - here we take a look at the MW-102588.1 from Emerio. Emerio isn't the most famous of manufacturers - however that isn't to say that we'd score this product any less as a result - we just hadn't come across them before. Finished in bright pink, the MW-102588.1 is controlled by two dials, making it ideal for those who struggle with complicated buttons and menus. Capacity is a relatively small 20 litres, and power output is a mere 700w - however it works well, and is easy to clean. Should you buy this model? Well that depends on whether you love the colour scheme or not. Essentially this is a functional solo microwave oven that is reasonably priced, in a very competitive market. 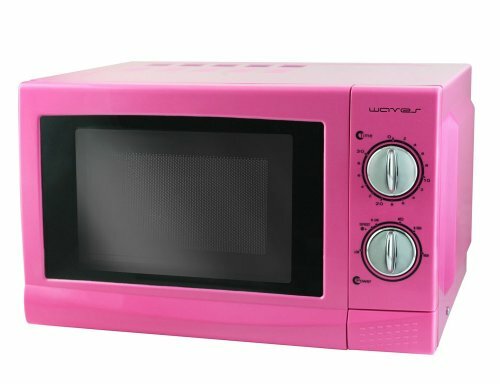 There are plenty of other similar sized microwaves available in the same price range - so the main reason to buy this one would be due to the pink colour scheme. Overall Emerio is not a brand name that we're hugely familiar with, but with the MW-102588.1 pink microwave, they've created an easy to use and functional kitchen appliance, which will appeal to those who love all things pink. I live in the United States and I am having a very hard time finding a colored microwave. Does this one only come with a European pronged cord, or is it also available in an American version?